Credit unions are facing significant challenges in the form of fintech startups, disruption, digitization, and evolving member expectations. It is imperative for credit unions to understand the role of data and analytics in financial services today. Data analytics is the next major step for credit unions to continue to compete in financial services and improve member service, and as we have seen in the past with initiatives such as shared branching or ATM networks, collaboration will help credit unions to achieve advanced analytics capabilities. 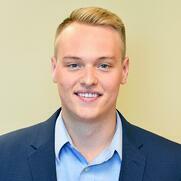 Austin J. Wentzlaff joined OnApproach in 2013 as a Business Development Analyst and is now currently Vice President of Business Development. He is responsible for developing marketing strategies, driving prospects to contract award, building and maintaining high-level relationships with current and prospective clients and strategic partners, and elaborating business development plans that support business growth. Austin is an alumnus of Gustavus Adolphus College in Saint Peter, MN. He graduated Gustavus Adolphus College with a B.A. in Financial Economics.